Despite their name, jackrabbits are hares, not rabbits. One of the defining characteristics of hares is that they raise their young above ground, with the mothers leaving their babies -- leverets -- alone while they go foraging for food. This means you might come across a lot of apparently orphaned baby jackrabbits during breeding season. Those leverets are almost certainly not abandoned. The worst thing you can do is try to rescue one, which might be a death sentence. Even if the jackrabbit survived, he would have difficulty adjusting back to the wild after being raised in captivity. If you see a baby jackrabbit, walk quickly in the opposite direction. Contrary to one popular myth, mammalian mothers do not abandon their babies just because another animal touched them, so if you or a child has handled the leveret, don’t worry. Put him back where you found him and leave the area. If your cat or dog brings home a baby jackrabbit, you have a more difficult situation on your hands. Remove him from your cat and leave him unattended in a secure room, such as the bathroom, for half an hour or so. Add a dish of water. After being caught by a predator, he may be in a state of near paralysis from fear, which is hard to distinguish from injury. After an interval, if the leveret is uninjured and you know where he came from, put on heavy gloves, in case you need to touch him, and get him into a pet carrier or box. Release him where he was caught and leave -- his mother probably won't be far away. If he's injured, contact a local wildlife charity, animal control or your vet for advice. Jackrabbits, and other hares, have not been domesticated and don’t usually make good pets. 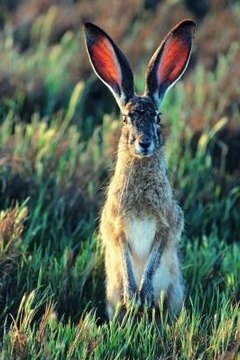 However, there are a couple of rabbit breeds who look very much like jackrabbits and can make lovely companions, the Belgian hare perhaps being the most hare-like example. As with any other rabbit, they should be kept in pairs and are a substantial commitment in terms of time and expense. Rabbit Rehome has estimated that one rabbit costs about $750 a year, not including veterinary emergencies. Always get your rabbits neutered or spayed, to prevent behavioural and health problems as well as unwanted offspring. It's possible you’ll have the opportunity to adopt a jackrabbit who cannot be returned to the wild, probably one of the “orphaned” babies who's been raised by some well-meaning person. In this case, bear in mind that he’ll need a lot of space, preferably in the form of a secure outdoor enclosure. He might become quite aggressive as he matures -- this isn't a pet bunny. Don’t adopt such an animal unless you have the space and experience of caring for near-wild animals. Generally, the diet is similar to a rabbit's, consisting mostly of grass or hay.